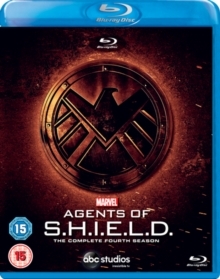 All 22 episodes from the fourth season of the action drama spin-off of 'Marvel Avengers Assemble' (2012). Clark Gregg reprises his role as Agent Phil Coulsen, who runs an elite team for the Strategic Homeland Intervention, Enforcement and Logistics Division. The episodes are: 'The Ghost', 'Meet the New Boss', 'Uprising', 'Let Me Stand Next to Your Fire', 'Lockup', 'The Good Samaritan', 'Deals With Our Devils', 'The Laws of Inferno Dynamics', 'Broken Promises', 'The Patriot', 'Wake Up', 'Hot Potato Soup', 'BOOM', 'The Man Behind the Shield', 'Self Control', 'What If...', 'Identity and Change', 'No Regrets', 'All the Madame's Men', 'Farewell, Cruel World! ', 'The Return' and 'World's End'.